Portrait painted in 1914. Material – oil on canvas. The picture can be seen in the State Historical Museum. The generational image of the character is a traditional method of creating ceremonial portraits of significant persons, common in Russian painting. Portraits of members of the imperial family were often painted, painters, each in his own way, tried to capture noble people as expressively and precisely as possible. The last Russian empress appears on the canvas of Makovsky as a pretty lady dressed in a beautiful white dress. The head is decorated with a diadem with diamonds and sapphires. Cornflowers and lilies of flower ornament – a symbol of imperial power. Hair is carefully collected in the hair, only a naughty short curl clung to his high forehead. The expression of the face reflects the character of Alexandra Fedorovna – restraint and patience. Interestingly, such an expression can be seen in numerous photographs of the royal family – the wife of Nicholas II appears to the viewer without a smile, with a deeply hidden, hidden sadness in his eyes. In addition to the tiara, jewelry includes small rounded earrings, a pair of bracelets and a ring. White fur down from one shoulder – only crossed arms of a woman keep him from falling. It can be assumed that a white dress of fine silk with a beautifully trimmed bodice refers to the empress’s exit wardrobe – it is known that in everyday life her clothes were simple, comfortable. 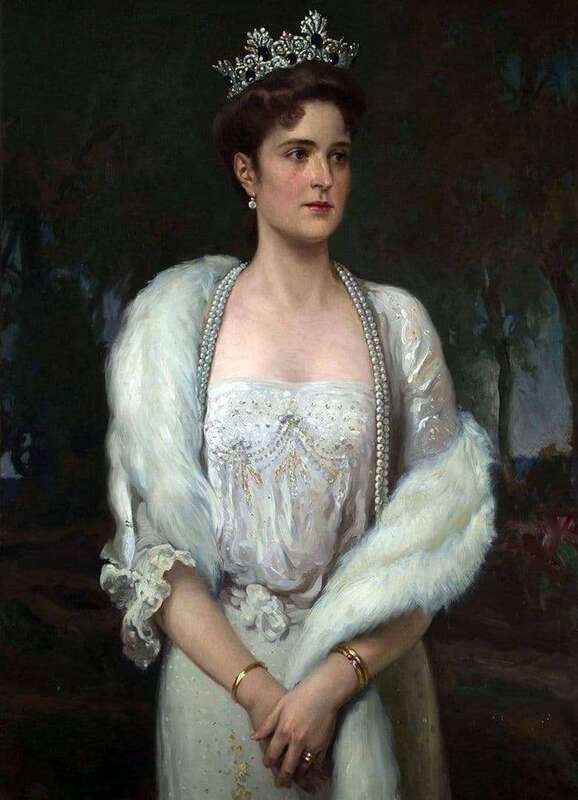 Alexandra Fedorovna is depicted on the background of nature, it can be assumed that the painter chose a palace park for the background of the painting. Against the background of the thick shade of trees, the female figure looks especially expressive. The inner world of the royal person is as close as possible to the public, Makovsky is trying to show in her heroine her humanity, modesty, shyness. The social hostility, espionage charges, the struggle for the life of the only son every second – a difficult fate made it impossible to show their pain and fatigue, the high rank did not allow public display of emotions. Or maybe it is the foresight of one’s own tragic fate.